Luis Suarez claims it is every kid’s dream to play for Liverpool, after penning a new contract which keeps him on Merseyside for the long-term. The Uruguayan international arrived at Anfield from Ajax just 18 months ago, and he has established himself as a firm favourite on the Kop. Last season was a difficult one for the 25-year-old, though, after he was forced to serve a lengthy suspension for racially abusing Manchester United defender Patrice Evra: an accusation he continues to deny. 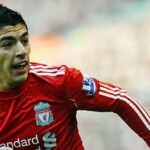 In the aftermath of this controversy it had been suggested that the Reds may offload Suarez, with Italian giants Juventus more than happy to offer him a route to Serie A. However, new manager Brendan Rodgers has made no secret of his admiration for the forward, who has scored 15 goals in 44 Premier League matches. And now it looks as though the pair will have plenty of time to work together, after the player signed a new deal to remain at Liverpool for the long-term future. And after putting pen-to-paper, he offered his opinion that he is living the dream of every young football fan. "To sign a new contract with Liverpool is unbelievable for me because I am so happy here at both the club and also in the city," he told the official club website. "When you are a kid, everybody wants to play for Liverpool. I am here now and it is a dream for me, and now I am a Liverpool fan. "I want to say thank-you to the fans because they are our 12th player. The supporters of Liverpool are unbelievable. Five or six years ago I watched on TV the stadium and the club, and now I play here and the supporters have helped me. That's very important for me."